Indian automobile giant Mahindra & Mahindra has opened a new $230 million plants for an off-highway vehicle in Detroit, the world's car capital, which got its first automotive production facility in 25 years. The new plant will create 250 new jobs in the US, the world's top automotive market. "This is an exciting day for Mahindra...," Mahindra Group Chairman Anand Mahindra said. "This building opening represents our company's growing presence in North America and locally in the Metro Detroit area where we have tripled our workforce during the past 18 months. We are committed to growing the Mahindra brand in North America and Michigan," he said. 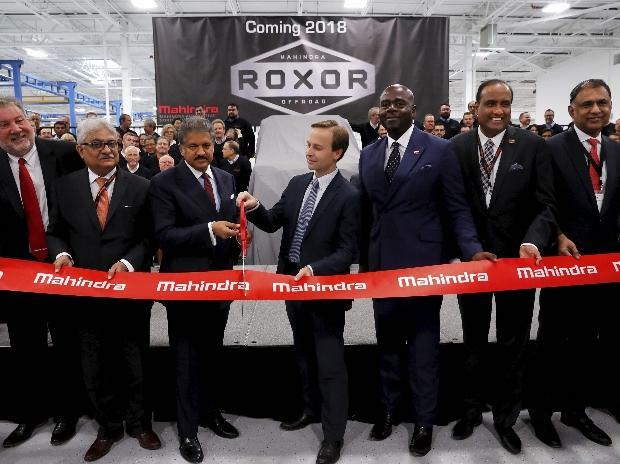 "It is pretty rare and extraordinary," said Michigan Lieutenant Governor Brian Calley at the Mahindra automotive plant launch event yesterday in Detroit metropolitan area. "You are an important and vital part of the resurgence of Detroit," he told Mahindra employees and top officials of the company. Within few weeks, the new facility will produce an off-highway vehicle which will extend Mahindra's current position in this growing segment, Mahindra said. Designed and engineered by Mahindra Automotive North America (MANA), the vehicle promises to be unlike anything currently on the market, he said. An off-road vehicle is one which is capable of driving on and off paved or gravel surface. "This expansion represents a milestone for us and for Michigan. We started this operation with seven people four years ago -- to be crossing the 250 mark is a testament to the hard work of our employees and what this region has to offer in terms of top automotive talent," said MANA president and CEO Richard Haas at the inaugural event. By 2020, additional planned projects will result in 400 more jobs and another $600 million in local investment over that same period. In addition, MANA will continue to provide Metro Detroit- based engineering support for new vehicle platform development for India and global markets. "It is a great day for my district and my State as this is the first automotive manufacturing facility in 25 years. This comeback is real and exciting," said Congressman Dave Trott adding that Southeast Michigan is the birthplace of automotive industry. "This illustrates the strong partnership between the Us and India," said Tom Vajda, the Acting Assistant Secretary of State for South and Central Asia as he welcomed the Mahindra automotive plan in Detroit region. Mahindra has in total 30 facilities having invested about $1 billion in the US and providing employment to some 30,000 people, Vajda said as he praised the contribution of Mahindra in American economy and strengthening India-US relationship. Mahindra was recently named as one of five vehicle manufacturers selected by the United State Postal Service (USPS) to produce prototype delivery trucks for testing and evaluation. At the request of the USPS, details about the program will be available at a later date, a company release said. The $19-billion group, which is present in more than 100 countries and operates in as many as 11 sectors, employs over two lakh people.